(Marcio Jose Sanchez | The Associated Press) Real Salt Lake's Damir Kreilach, left, celebrates after scoring against Los Angeles FC during the first half of an MLS soccer playoff match Thursday, Nov. 1, 2018, in Los Angeles. Los Angeles • Maybe there was something in the air. Or on the field. 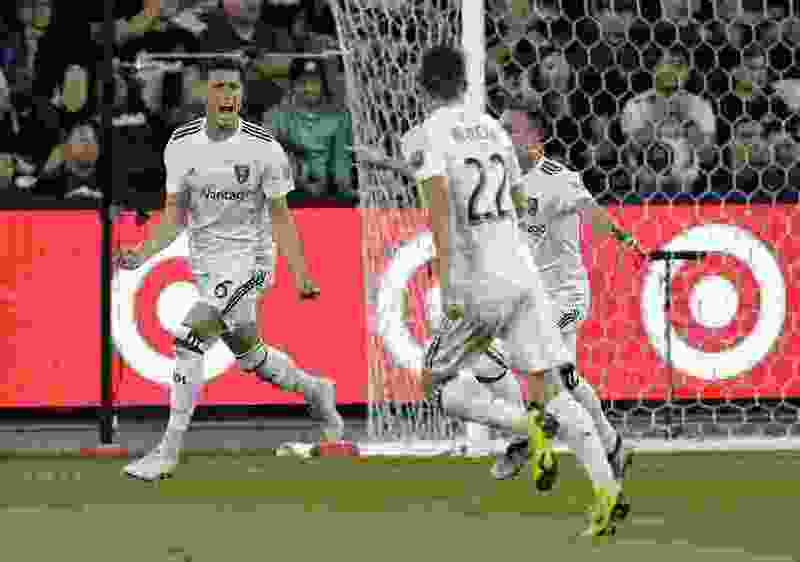 Just minutes before Real Salt Lake and Los Angeles Football Club face off Thursday at Banc of California Stadium, Columbus Crew FC pulled an upset with its win over D.C. United in penalty kicks. Columbus was a sixth seed that knocked off a third seed. RSL was a sixth looking to knock off a third. RSL pulled it off. It scratched and clawed its way to a 3-2 win over Los Angeles Football Club and advanced to the MLS Cup Western Conference semifinals. Real will host Sporting Kansas City at 8 p.m. on Sunday. Kreilach scored two goals and added an assist in the win. RSL overcame being outshot 21-4 by Los Angeles, which also had nine corner kicks. But it was Real’s defense that came to play against an LAFC team that had manhandled it in two regular-season matchups. Petke opted to start Nedum Onuoha, Luke Mulholland and Marcelo Silva, all of whom started against New England when Real had five starters out due to suspension or international duty. Salt Lake won that game when it needed it most. RSL amassed 41 clearances to just 10 for Los Angeles. Kreilach’s first goal came in the 21st minute. Right back Brooks Lennon, after getting a pass from Jefferson Savarino, dribbled the ball into the attacking third. He crossed the ball clearly to Kreilach, who controlled the pass off his chest and blasted a right-footed strike into the back of the net from right around the penalty spot. Los Angeles equalized just 10 minutes later. After Aaron Herrera committed a foul and earned a yellow card, Carlos Vela had a free kick a few yards from the 18-yard box. He sent a cross into the box to Danilo Silva for a header goal. Moments after Danilo Silva’s goal, the referees suspended play for five minutes due to fans throwing objects on the field. Los Angeles started the second half with two good chances. Nick Rimando dove and stretched to save the first, and Latif Blessing’s shot missed over the crossbar. Christian Ramirez, who entered the game to start the second half, scored in the 55th minute off an assist from Lee Nguyen for a 2-1 LAFC lead. In the 58th minute, an Albert Rusnák shot was blocked and then cleared by LAFC. The ball ricocheted to Kreilach, who leapt in the air and scissor-kicked it off the right post and into the goal for a 2-2 tie. Beckerman said someone made a “Karate Kid” reference to him when describing Kreilach’s equalizing goal. “It was unbelievable,” Beckerman said of Kreilach’s goal. In the 69th, RSL held possession in the attacking third. Kreilach passed to Savarino, who flicked it to the near post and into the goal for a 3-2 lead. The goal was officially credited to Walker Zimmerman of LAFC as an own goal.